The Huis Ten Bosch and the Kujukushima Island are the famous sightseeing spots in Sasebo. As there is the American Base in Sasebo, a lot of gourmets are related to America. In order to enjoy your trip to the full, you need to fill your stomach. So, I’m introducing special gourmets which will make your sightseeing more enjoyable. 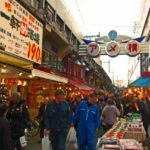 When you visit the Sasebo-city in the Nagasaki prefecture, please drop in at these shops! The recipe was conveyed directly from the American Navy Base and a hamburger shop opened near the Base. They used to be sold to the Americans who were working at the Base, Then later on, it spread to the Sasebo-city in 1950. The definition of the Sasebo-burger is to use the local ingredients and hand-make them after receiving the order. At the moment, there are 25 shops inside the city and 2 outside. The certified shops have the signboard of its mascot character, [Sasebo-burger-boy] designed by Mr. Takashi Yanase who is the writer of Anpan-man. The recommended shop is the [Hikari] which opened in 1951. The counter-seats number 7 and the tables with the chairs are outside the shop, but it is always overrun. It is the origin of the Jumbo-burger and the best menu from this shop is the Special-burger. The freshly baked crispy bun has the juicy patty, melting cheese, bacon, egg and fresh vegetables.It is filling, but easily goes down with the sweetish sauce. At the weekends, there is often a queue, but actually, the similar Sasebo-burger shop, [Log KIT] is next to it, so it may be interesting to have an eating comparison, if you have enough space in your stomach. 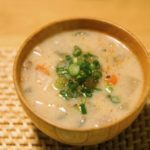 One of the greatest men in the Japanese Navy who had had an important role from the end of the Shognate to the beginning of the Meiji-era came across the beef-stew during his study abroad in England. He couldn’t forget the taste and tried to copy it. But at that time when the ingredients were short, he couldn’t obtain the wine or the demi-glace-sauce, so the result after cooking using the soy-sauce as well as sugar ended up as the Miku-jaga (meat and potato sweet stew). Later on, to be based on the Stew・des・Beef written on the Navy’s recipe book, [Navy Cooking Skill Reference Book] in the Meiji-era, the arrangement was added and the [Kaigun-san-no-Beef-stew] was developed. Depending on which shop, the taste such as beef-bone soup and demi-glace-sauce is different. It is fun to have an eating comparison. The recommended restaurant is the [Gas-light Sanbankan] with the nostalgic atmosphere. The high-quality beef produced in Japan using their proud demi-glace-sauce is a large block, but is so tender that it melts and splits in the mouth. The pasta is underneath, so please have it mixing them. 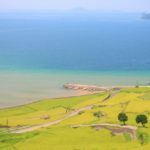 The Kujukushima Island is the place of scenic beauty. The souvenir from the Kujukushima Island is the [Kujukushima-Sembei]! It is different from the rice based sembei. It has the wheat flour and the peanuts in its ingredients. It is the standard Sasebo souvenir and received the Monde Selection Grand Gold Award for the 8 consecutive years from 2010 to 2017. Taking the hint from the sea-turtle shell, it has the hexagonal shape and the inlayed peanuts indicate the islands of Kujukushima. You can buy one at any place such as the souvenir-shops in the prefecture, the airport or the kiosk at the stations. The [Kujukushima Sembei] which has been producing and selling them opened its shop in the Sasebo-cityIn 1948. At that time, it was difficult to obtain the ingredients because of the wartime shortage. At the beginning, they processed the rationed unrefined sugar brought in by their customers to the sweets or the Sembei (rice cracker). 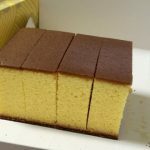 Since its first sale, it has continued to be the long-seller and some people have been eating them throughout 3 generations. If you don’t know what to buy as a souvenir, there is no mistake in choosing the [Kujkushima-Sembei]. The standard rolled sushi is tekka-maki in which the red tuna is used. But in the Nagasaki prefecture, there is the [White tekka-maki] using the white-fish-meat. 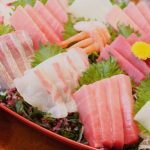 In the Nagasaki prefecture which has a small haul of the red-meat fish like tuna, it has the major rolled sushi, [White tekka-maki] which suits the locals’ taste using easily available white-fish-meat. Even in these days where the circumstances of the logistics have improved and the tuna is available to get hold of, the [White tekka-maki] is still the locals’ favourite. Mainly the Hiramasa (yellowtail amberjack) called Hirasu, Buri (Japanese yellowtail ) and Kanpachi (Greater amberjack) are used. Compared to the tuna tekka-maki, the chewy texture is characteristic. You can taste it at many sushi-shops in the city. At the recommended shop, [Shomin-no-ryotei Sasaizumi], you can enjoy tempura, grilled-fish, deep-fried dish and all kinds of Japanese cuisine starting with sushi. They have the counter-seats, the large hall, the table-seats and the private rooms. You can enjoy the gourmets quietly on your own, with your family or in a group with an exciting atmosphere. They are open at lunch time as well. 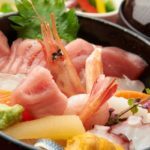 In the evening, it could be enjoyable to have sake, nibbling the delicious fish and shell fish dishes, such as the [White tekka-maki], squid-sashimi or Nagasaki herb mackerel. When you visit Sasebo, please taste them. There may be many people who drink Tonyu for the sake of their health, but don’t you think it is not easily drinkable? Actually, the Tonyu which has been familiar for a long time in Sasebo has been made to be fairly sweet unlike other Tonyu, so it is easily drinkable. It contains ginger to get rid of the smell of the grass which is the characteristic of the soy beans. The shape of the package is unique as well. It is not a paper pack but a tube-type looking like a rocket, so you can drink by sucking from the hole cut by a pair of scissors. Some people make a hole at the bottom. Both adults and children like the taste with sugar and ginger. In the city a few makers have been producing and selling it. You can buy it at a supermarket. Depending on which make, there are the banana or coffee flavours. The Tominaga Tofu-ten established in 1967 is the locally famous shop. Starting with the Sasebo-tonyu, they have been selling the Tofu using the selected soy beans produced in Japan and the doughnuts in which tofu, okara (bean curd) and tonyu are used is popular as the Tommy Doughnuts. Generally, Sasebo-tonyu is sold in a pack of 3, but as the opening date is 5-7 days, you need to be aware of it. Please try it even once! 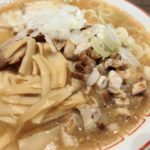 For a ramen in Kyushu, it might be unique, but the [Ramen Toride] in Sasebo is a [Kaipaitan] specialist. The exquisite soup is the mixture of the essence of the razor clams from the Sasebo Harioseto, cockles, scallops and oysters as well as the squeezed juice from the soy-beans and the secret sauce which was never allowed to be taken out! The familiar tonkotsu (pork bone) and chicken bone are never used for this Kaipaitan soup and it is recommended to females, as it has low calories. The [Ramen Toride] has only 7 counter-seats and 4 table-seats, so, it is not a large shop obviously, but focusing on the locals, it is always crowded and it has gained the good reputation as a shop at where some people want to eat even if they have to wait. The noodles for the [Kaipaitan] soup are the middle thick wrinkled ones. 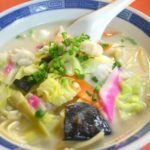 At the [Toride], you can enjoy the standard menu [Kaipaitan soup] to the full, but the more popular menu is the [Chojinteki Ebishio] which contains the prawn paste, prawn-wantan and prawn with its head. The prawn lovers can’t wait! From Tuesday to Friday, you can enjoy the morning-ramen for the exceptional price, ¥500. Why don’t you get up early and try it? It is the pressed sushi which received the Processed Marine Products Category Award in the contest, the [Sasebo ★Star Products] held in 2010. 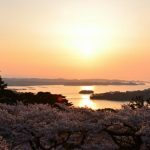 It has been developed in order to be the [brand-new special product which represents Sasebo] and it was made using the [Kakaraha] which have been growing on the islands of the Kujukushima. The old leaves of the Kakaraha wouldn’t fall off until the new buds come out. Therefore it is known as the lucky leaves which contribute to the prosperity of the descendants. In Kyushu, there is the tradition that the manju (dumplings) are wrapped with these [Kakaraha] and the oshi-zushi (pressed sushi) was made, taking a hint from it. If you would like to taste the [Kujukushima Kakaraha-sushi], the [Fuji・Naga Honten] is recommended. It has been the popular Japanese cuisine restaurant in the local area since its establishment, 60 years ago. The fatty mackerel, horse mackerel and sea-bream which are caught in the Kujukushima home waters are used together with the salt and vinegar in a balanced manner. It is time consuming work, taking 5-6 hours to make it. It is no wonder that they limit the number to only 5 per day. However, if you book some in advance, this shall not apply to you. If you want some to take away, you also should make a reservation. You can have it at lunch time, between 11:30 and 14:30. It would be better to check it by phone before you visit. It always depends on the circumstances and the stock of fish. The previous president opened [Coffee shop Bee’s House] together with his brother in 1948. It is the western-styled restaurant which has been loved for 70 years locally and the Cream-puff is very popular. They started selling the Cream-puff in 1953. At that time, there was the shortage of wartime ingredients, but they could obtain them more easily because the American Base was close by. The custard sauce with the fragrance of the rum was put inside the Choux pastry and the slightly bitter as well as sweet Scotch sauce made from banana and baked apple, sugar and condensed milk was poured on the Cream-puff. Unlike the general cream-puff, the texture has a different taste with the sourness as well as sweetness of the fruits and the slight bitterness of the sauce. They have the super big Cream-puff of 2kg which is 10 times as big as the general one. It was made on the request from a girl who wanted to treat her mother on her birthday. Her mother loved the Cream-puff from the Bee’s House. If you book it, you can buy one. If you are interested in it, please ask for more details! You can also enjoy the Sasebo gourmets such as the [Lemon-steak] and [Kaigun-san-no-Beef-stew]. The curry and rice which has been on the menu since its opening is popular as well. Please don’t forget the Cream-puff after the meal. Depending on which area, this sweet is called differently, like [Imagawa-yaki] or [Ohban-yaki]. In Sasebo, it is called the [Kaiten-yaki]. Using the same method as its establishment in 1950, the local Mums are briskly baking them. For the locals, it is a familiar taste since their childhood. It had been closed for a while because of the renovation of the building, but it reopened in December 2015. As they are baked rotating the round copper table just like on a turn table, they were named the [Kaiten-yaki] (rotate baking). 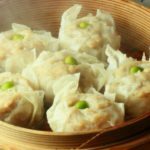 The resilient sheet just like the dough of the Tai-yaki (sea-bream shaped) is crispy and a less sugary filling is added. There are 2 fillings, the black one is made from the red-beans and the other white one is made from white kidney-beans. In front of the shop there is always a long queue and some people buy 10 or 20 of them. You can always enjoy the freshly baked one! You don’t have to worry which filling you should buy. Let’s buy both of them! Originally, due to the influence of the American Navy, the steak had become the general dish. This cuisine was devised to adjust to the hot summer as well as the Japanese taste. 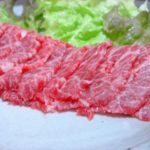 Place the thinly sliced beef on the iron plate and eat it putting on the soy-sauce and the lemon juice. The refreshing lemon sourness invites your appetite. In the sauce and the meat juice left over, add some white rice! It looks a little bit like bad manners, but this way of eating is the right one. You can enjoy it until the very end. This cuisine has been offered at more than 20 restaurants in the city, but the recommended one is the [Lemoned Raymond] which is the first Lemon steak restaurant in the Nagasaki prefecture. The [Lemon steak-set] of 120g beef comes with the salad, soup and rice or bread. They have the big Lemon steak of 200g of beef for a big eater. When the thinly sliced beef with the lemon cut in round pieces on the top is sizzling, put a little sweetish lemon sauce on the top of it. It generates a more appetizing sound. Please enjoy this delicious dish to the full. Let’s eat the delicious gourmet in Sasebo! How was the article? The most important thing in choosing gourmets is not whether it is famous or not but whether it is delicious or not, isn’t it? I’ve introduced the dishes focusing on what the locals often eat. If you don’t come to Sasebo, you can’t taste any of them. How about [Kuidaore in Sassebo] (ruin oneself financially by one’s extravagance in food) on your next trip? 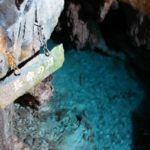 Please refer to this article when you come to Sasebo.